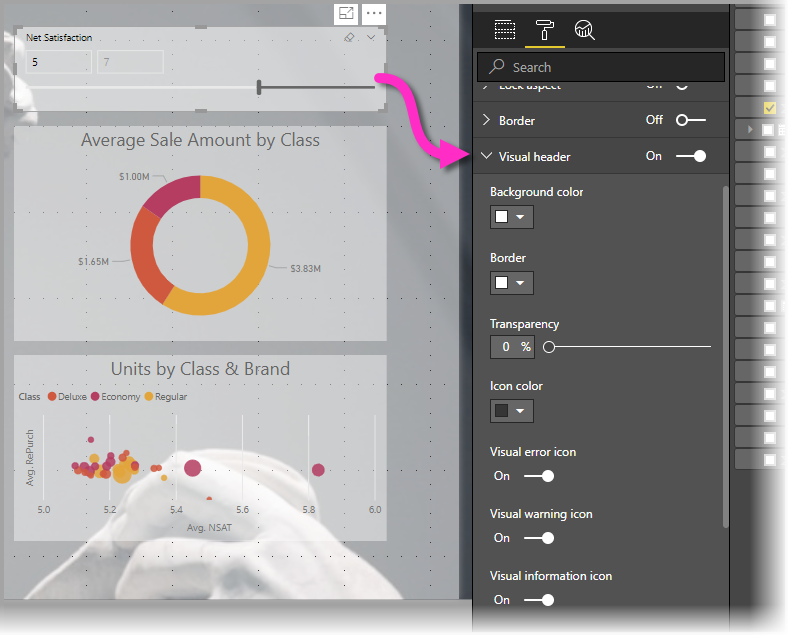 With Power BI Desktop you can use visual elements, such as wallpaper and improved visual headers for visualizations, to enhance the appearance of your reports. 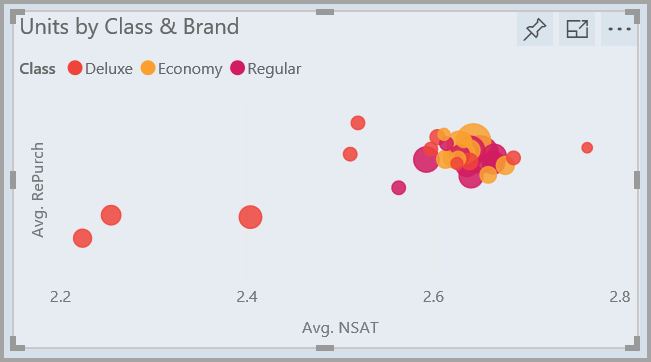 Use improved visual headers for individual visualizations to create perfectly aligned visuals on your report canvas. The following sections describe how to use these enhancements, and how to apply them to your reports. You can format the gray area outside your report page using wallpaper. The following image has an arrow that clarifies where the wallpaper area applies. You can either set wallpaper on a per-report-page basis, or have the same wallpaper for every page in your report. To set your wallpaper, tap or click the Formatting icon when no visual is selected in your report and the Wallpaper card appears in the pane. You can choose a color to apply as wallpaper by selecting the Color dropdown, or you can select the Add Image button to select an image to apply as wallpaper. You can also apply transparency to your wallpaper, whether it's a color or an image, using the Transparency slider. 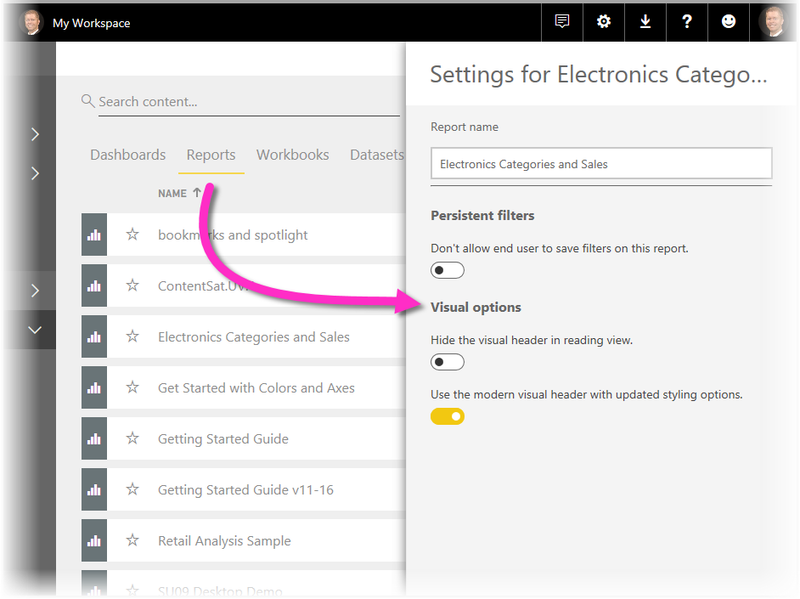 The area in the canvas where you can place visuals is referred to as the report page, and in the Format pane can be modified using the Page background dropdown. The report page is always in the foreground (when compared to the wallpaper), while the wallpaper is behind it and the furthest-back element on the report page. When you apply transparency to the page, the visuals in your report also have the transparency applied, allowing your wallpaper to be visible in the background through your visuals. When you set your page background to greater than 50% transparency, a dotted border appears while you are creating or editing your report, to show you the boundary of the report canvas border. It's important to note that the dotted boundary only shows up when editing your report, and does not appear for people who are viewing your published report, such as when it's viewed in the Power BI service. If you use dark-colored backgrounds for wallpaper and set text color to white or very light, be mindful that the Export to PDF feature does not include wallpaper, so any exports with white fonts will be nearly invisible in the exported PDF file. See export to PDF for more information on Export to PDF. 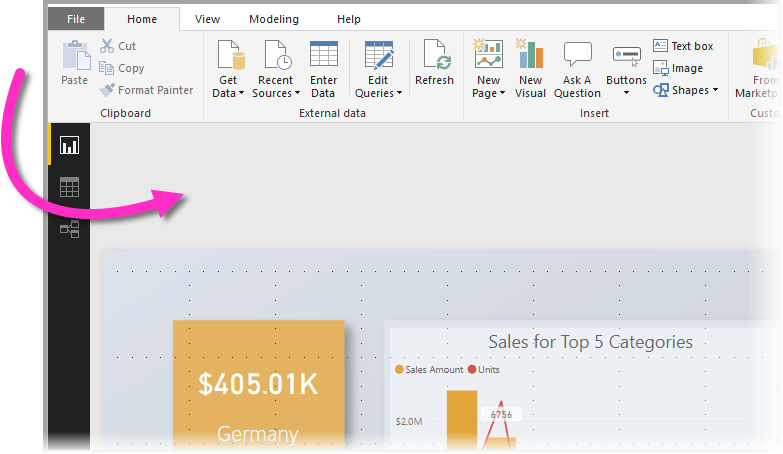 Beginning with the July 2018 release of Power BI Desktop, the headers for visuals in reports have been significantly improved. 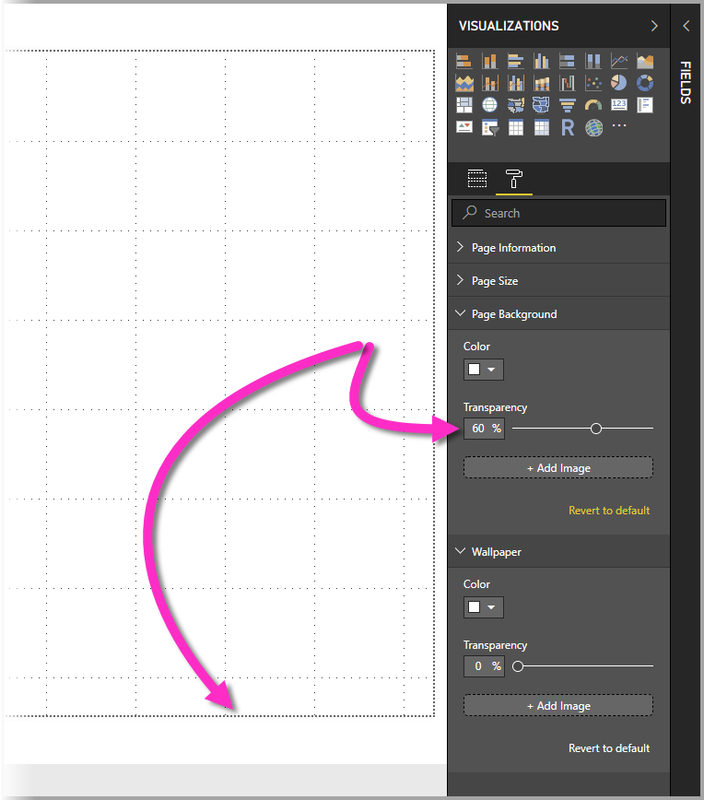 The primary improvements are that the header has been detached from the visual so its position can be adjusted based on your preference of layout and positioning, and the header now appears within the visual itself instead of floating above it. By default, the header appears inside the visual aligned with the title. In the following image, you can see the header (the pin icon, the expand icon, and the ellipses icon) within the visual and aligned to the right, along the same horizontal position as the visual's title. If your visual doesn't have a title, the header floats above the top of the visual aligned to the right, as shown in the following image. If your visual is positioned all the way to the top of your report, the visual header instead snaps to the bottom of the visual. The visibility of toggles do not affect your report when you are authoring or editing the report. You must publish the report and view it in reading mode to see the effect. This behavior ensures that the many options provided in visual headers are important during editing, especially warning icons that alert you to issues while editing. 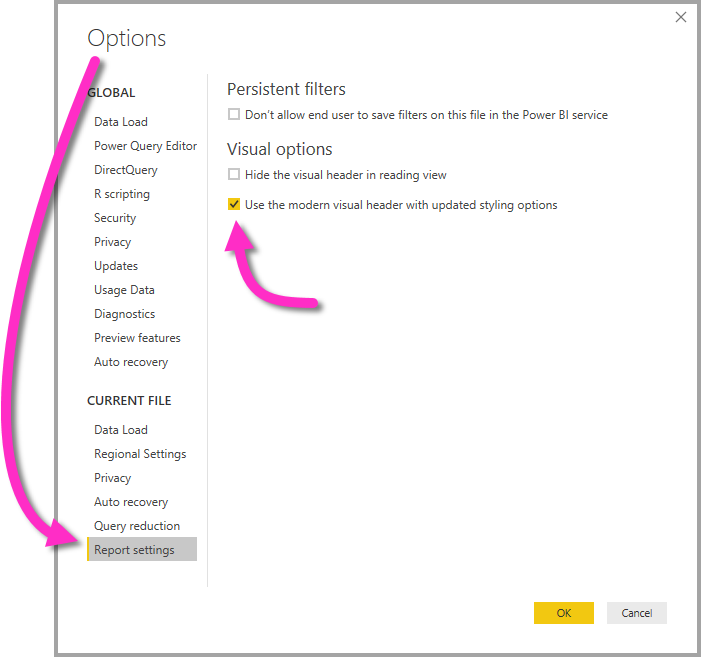 For reports that only appear in the Power BI service, you can adjust the use of visual headers by going to My Workspace > Reports and then selecting the Settings icon. There you see settings for the report for which you selected Settings and you can adjust the settings from there, as shown in the following image. The new visual header is the default behavior for all new reports. 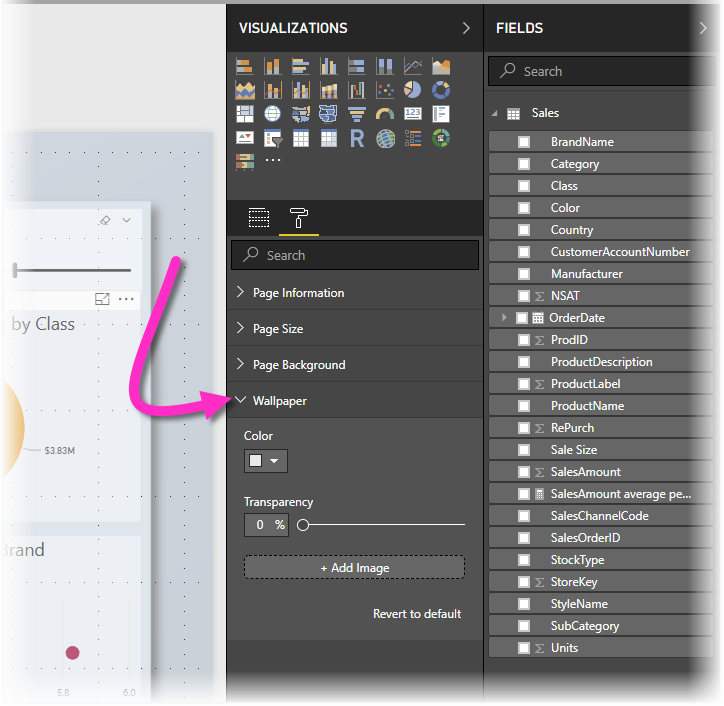 For existing reports, you need to enable this behavior in Power BI Desktop by going to File > Options and settings > Options and then in the Report settings section, enable the Use the modern visual header with updated styling options checkbox. For more information about Power BI Desktop, and how to get started, check out the following articles.